Imagine living in a neighborhood with 53 gang-related homicides in a single year — none solved. Eighty-six percent of your neighbors report having heard gunshots in the past month, but police are little help. Though few even bother to report crimes anymore because of fear of retaliation, when the police are called, more than three-quarters of the time, they don’t show up in a timely manner. This is a statistical window into what it is like to grow up in a Caribbean gangland. 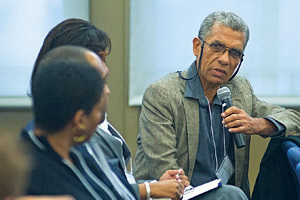 At a February 17 event that drew a crowd of diplomats, policy makers, U.S. and Caribbean researchers, AU’s School of Public Affairs hosted the Inter-University Consortium for Caribbean Gang Research in a dialogue about the causes and potential responses to rampant gang crime and violence throughout much of the Caribbean. Anthony Harriott, University of the West Indies–Mona Campus, gave a first-hand account of the situation in Jamaica. Though in much of the Caribbean, crime rates were traditionally relatively low (lower than some parts of Europe and the United States), a skyrocket in rates of violence over the last decade can be tightly correlated with gangs and organized crime. Less cohesive, less organized, often urban poor communities fall first to the control of gangs. They can become part of a broader system of corruption, where gangs keep people from the voting booth through intimidation in some communities and deliver votes to particular parties in others, thus securing control over neighbors and strong ties to those in political power. The trouble is the difference between perception and fact. People living in communities with high poverty and failing police presence often come to rely upon local gang leaders, even though much of the violence they seek to mitigate by gang law is caused by the gangs themselves. Among other presenters, Charles Katz, Arizona State University, and SPA professor Edward Maguire shared key findings from the pair’s six-year research project in Trinidad. Their research challenges much of the accepted rhetoric surrounding gangs and how to shut them down. Maguire and Katz studied 10 gangs in four Trinidadian neighborhoods that were hotspots for violent crime, areas no broader than 600 feet long (or about a city block). In looking at violence specific to these neighborhoods, the researchers found rationales for violence greatly varied, indicating that theories of “root causes” of gang violence (i.e., poverty or the drug trade) were not acknowledged motivations for violence by these gang members. In direct interviews with gang leaders, violence often was shown to have very local causes. In Trinidad, gang members killed people over perceived disrespect, territory, disputes over money or girls. They killed in retaliation, as part of internal power struggles, or in revenge for ratting to police. According to Maguire, esoteric factors contribute to upticks in violence. “You’ve got one guy who just got out of prison and he’s really angry, and he’s got a gun, and he’s got a set of people he wants to kill. There’s not a ‘root cause’ there.” In analysis, one could look deeper and possibly connect this one man’s situation with broader cultural factors, but what is really instigating violence is a more proximate cause — an angry man with a gun.